This long baby one-piece is an absolute good mood favorite! The friendly doggie on the chest that makes the blue-striped one-piece a sweet eye-catcher ensures it. 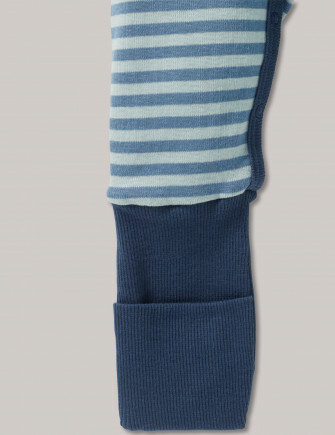 The dark blue elbow patches provide additional fun details with their orange-colored decorative stitching. The only thing missing now is the practical Vario cuffs on the feet, 100% cotton and high-quality snap buttons and finally your little treasure can feel good all around in the best SCHIESSER quality! from the SCHIESSER line "Cool Dogs"